The Gestetner embedded solution is developed in-house by the PaperCut Software development team. This ensures that the copier interface is consistent with the workstation print interface, meaning users only have to learn one system and one set of terminology. 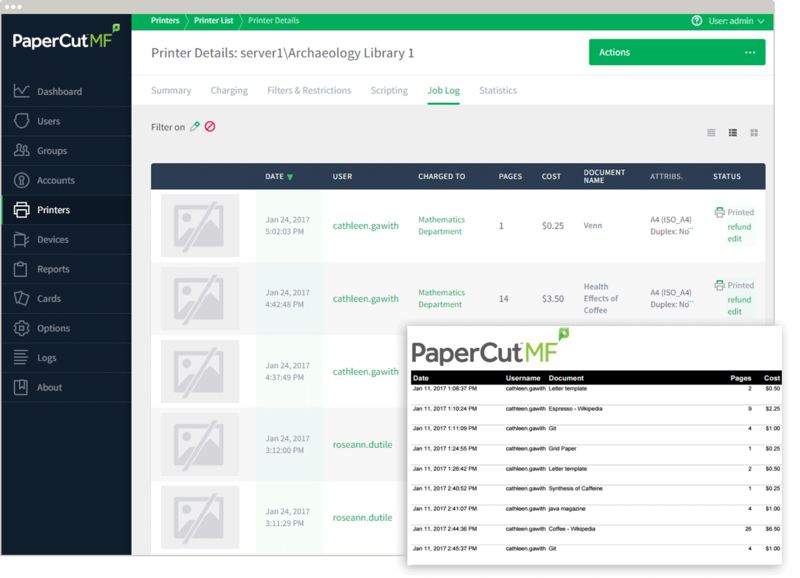 PaperCut is a single integrated solution where print and copier control are all managed in the one system. Users have a single account and administrators have the same level of reporting and administration for all services. The embedded solution interacts with the PaperCut server using a Service Oriented Architecture (SOA) and web services based protocols. PaperCut is developed under a release-often policy where new features are made available to users as soon as they are complete. Unlike hardware based solutions, new versions can be delivered to users regularly as software updates. PaperCut remains true to its vendor neutral stance. All embedded solutions are equal and support all server OS's including Windows, Linux and Mac. A large percentage of PaperCut's user base is in education environments where security is important. All embedded solutions are developed with security in mind. Where security objectives can't be satisfied, any deficiencies are fully disclosed. Leverage your existing single sign-on infrastructure by allowing users to log in with the same username and password used elsewhere on the network. No need to remember and maintain multiple logins! Optionally authenticate with swipe cards, proximity cards and optional PINs for extra security. Use your organization's logo and colors scheme. Also known as "Pull Printing", Find Me printing provides users in environments with several identical multi-function devices to print to a single virtual global queue. They can then walk up and log on to a device nearby available device and have their print job pulled from the global queue and printed on the spot. More on Find Me printing in our PaperCut NG tour. For more information about reporting see the Reporting tour section. PaperCut's embedded solutions work together with the PaperCut server software. This means that you benefit from a choice of server operating system (Windows, Linux, Mac, and Novell) and all management is conducted from one single location. There are no hidden extras such as external dependencies or database licensing. PaperCut supports all Gestetner MFDs with Embedded Software Architecture (ESA) SDK versions 2/4/5/7/10/11/12. The Java VM card must be installed in the MFD by a Gestetner supplier. Devices with a Fiery print controller are NOT supported. Devices marked with * support Integrated Scanning. PaperCut makes all attempts to keep the product compatibility information on this website current. However, we make no warranties, express or implied, with respect to manufacturer's products or the interoperation with the listed PaperCut product(s). We offer 40 day trial versions of PaperCut software to assist you with compatibility testing with your network setup. If your device model is not listed, please contact your Gestetner dealer to confirm that the device supports one of the above ESA SDK versions, and has an LCD touchscreen.